This is a crank hub design which allows the use of quick change HTD (High Torque Drive) blower pulleys on a KL motor. This part was designed to be integral with the existing crank mount camshaft drive pulley. 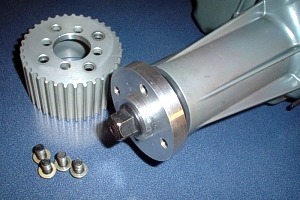 This is the machined hub with mated cam drive gear on the bottom. 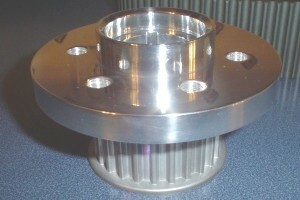 The bolt circle and centering ring is the standard profile for most blower pulleys. 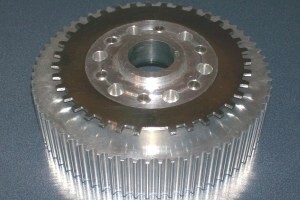 This enables a large selection of quick change gearing. This is an EDIS 36-1 crank ring that was designed to mount to the HTD pulley crank hub. It will enable the use of the standard Ford EDIS module in the ignition system.. This is the laser cut piece installed on the back side of the hub. Notice the raised centering ring in the center of the hub. This fits into a machined counterbore in the cam drive pulley. This is a quick change HTD pulley hub for an Eaton M90 supercharger. It was designed to complete the HTD drive system and replace the serpentine belt pulley that comes on factory M90 superchargers. Here is the finished piece installed on a factory new Eaton M90 which has been modified to enable a 17,000 RPM max rotor speed. This combination should be good for some serious boost. This is a drawing of the structure of a new design cross ram intake manifold for the KL motor. The design is currently in fabrication. Flow design analysis was performed during the design stage to produce the most optimal flow patterns for the KL engine. 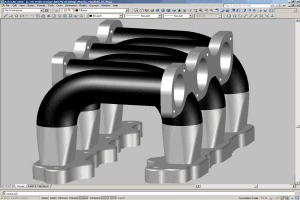 This design uses upper flanges to mount a wide variety of infusers, individual throttlebodies or other arrangements. This design shown is the composite model which was designed to be constructed of aluminum flanges and carbon fiber runners. This is a Porsche Brembo monoblock 4 piston caliper which can be easily mounted to a KL based car with the use of adapters and some larger diameter rotors. 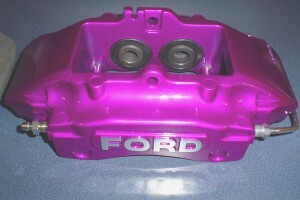 Here is the acutal caliper.